I found myself in an “interesting” situation on Friday because I started up the Windows 8.1 installation on one of my test machines, then decided to abort after the first couple of screens. I was working with an ISO I’d edited using the WinISOUtils to remove the cversion check to attempt an “upgrade” from Windows 8.1 Preview to Windows 8.1 RTM. But when the patched version of the installer got to my upgrade options screen, upgrading with programs and personal settings did not appear in the menu. Thus, I decided to abort, and see if I could fix my problems and attempt that option on another try. It was not to be! I was in for a surprise when I next rebooted, because the Win 8.1 Preview refused to boot properly — my UEFI BIOS informed me it couldn’t find a valid boot drive on my system. Alas, attempted boot repairs couldn’t bring my system back to life, either. Faced with the option of re-installing an image backup of the prior Win8.1 Preview, or a clean install of the Windows 8.1 RTM, I opted for the latter, since it had been my plan to move up to that version anyway. The install went very quickly — it took less than 15 minutes to get to the initial configuration screens, and another 20-30 minutes to get through all the updates and to bring the machine online for test use. 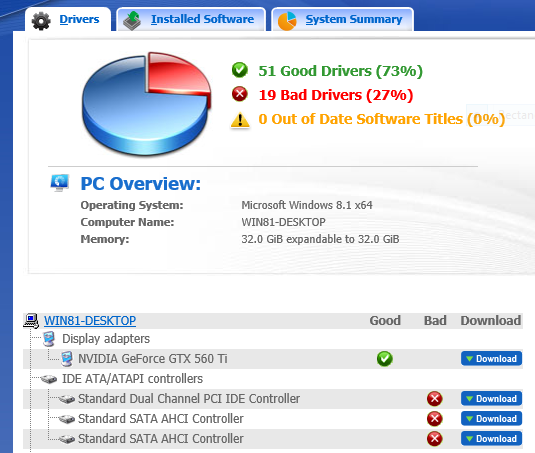 Following the install of the Windows 8.1 RTM, DriverAgent found 19 out-of-date drivers. DriverAgent found 19 drivers in need of updating after the plain-vanilla install: 8 or 9 of these were fixed by installing the latest Intel Chipset driver file (version 9.4.0.1026 for this particular PC), and dealing with the rest required updating my NIC driver, a couple of Bluetooth drivers, the Intel 82802 chip driver, JMicron and Marvell SATA controllers, the Intel Management Engine Interface, and a new, more PC-friendly version of the Intel Extreme Tuning Utility (XTU) version 2.1.1 (which worked on all the PCs I tried, including two Windows 7 PCs as well as 3 Windows 8 PCs of various persuasions, and solves DriverAgent’s long-standing issues with versions of the Intel Thermal Monitoring drivers used on so many modern motherboards nowadays). Overall time required to get a complete, up-to-date install for Windows 8.1 RTM consumed under two hours — that is, complete except for the applications I normally add to any of my test or production machines. As it is, I’ve still probably got another 2 or 3 hours’ work to bring the system completely up to snuff. Would that I could have taken the illicit upgrade route (which I’ve used before on other beta Windows OS versions with greater success) because all that time would have been saved. But that’s the way things sometime go in Windows-land. I wish I’d been able to completely diagnose the boot fault issue that occurred. It seems odd to me that a partial install would have messed with the MBR and left the boot/system drive in la-la land. But my rudimentary research didn’t lead me to any easy fixes, so I simply elected to blow the drive away and go forward from there. As things turned out, this resulted in some extra work for me post-install to restore my applications, but it also gave me the opportunity to work completely through a clean install, which left me impressed with the speed of the overall process. Even Windows 7 took at least half an hour longer to complete, even later in the release cycle and after gaining enough experience in the process to do it without having to puzzle problems through along the way any more.